If you’re like me, you hang off every news release and new photo from our tenacious Mars rover Curiosity. The awesome one-ton, six-wheeled robot is, after all, exploring a very alien landscape. But if there’s one thing I’ve learned from the mission, Mars is far from being a truly alien place. Sure, we can’t breath the thin frigid air, but we can certainly recognize similar geological processes that we have on Earth, and, most intriguingly, regions that would have once been habitable for life as we know it. This doesn’t mean there was life, just that once upon a time parts of Gale Crater would have been pretty cozy for terrestrial microbes. Personally, I find that notion fascinating. But, way back in May, I noticed something awry with our beloved rover’s wheels. 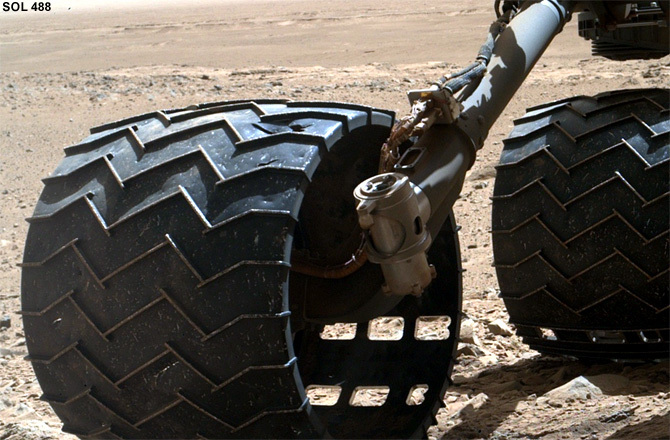 Curiosity’s beautiful aircraft-grade aluminum wheels were looking rather beaten up. Punctures had appeared. Fearing the worst I reached out to NASA to find out what was going on. After a friendly email exchange with lead rover driver Matt Heverly, I felt a lot more at ease: The damage was predicted; dings, scratches, even holes were expected to appear in the thinnest (0.75 mm thick) aluminum between the treads. On Mars, after all, there is no asphalt. Also, erosion is a slower-paced affair in the thin winds and dry environment — sharp, fractured rocks protrude, embedding themselves into the wheels at every slow turn. Then, on Friday, in a news update on Curiosity’s progress, JPL scientists mentioned that they would be commanding the rover to drive over a comparatively smooth patch to evaluate the condition of the wheels as their condition is getting worse. But isn’t that to be expected? Apparently not to this degree. 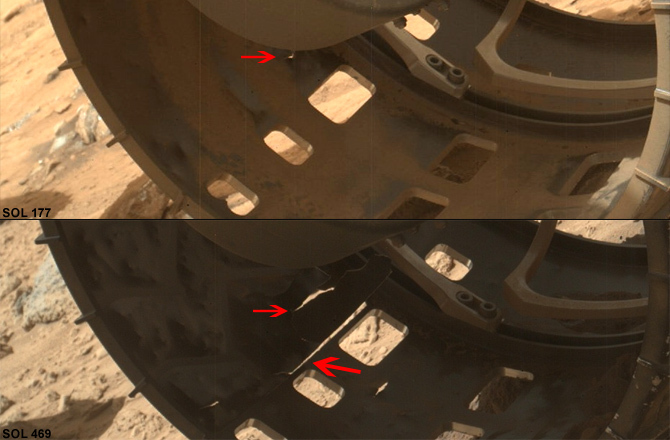 “Dents and holes were anticipated, but the amount of wear appears to have accelerated in the past month or so,” said Jim Erickson, project manager for the NASA Mars Science Laboratory at NASA’s Jet Propulsion Laboratory, Pasadena, Calif.
All of the wheels are exhibiting wear and tear, but this particular ‘rip’ in aluminum is by far the most dramatic. But what does that mean for Curiosity? We’ll have to wait and see once JPL engineers have assessed their condition. Although this kind of damage has inevitably been worked into the the structural equations for the wheels’ load-bearing capabilities, whichever way you look at it, damage like this is not good — especially as Curiosity hasn’t even roved three miles yet. But in the spirit of Mars exploration, Curiosity will soldier on regardless of how rough the red planet treats her.